The Parliamentary Ombudsman, Mr Anthony C. Mifsud, presented the Case Notes 2018 to the President of the House of Representatives, the Hon. Anglu Farrugia. 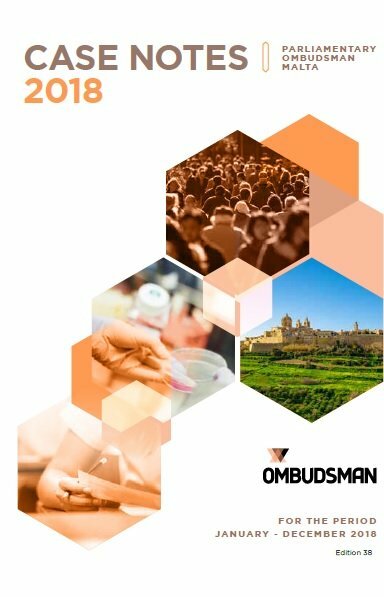 The annual publication of case notes is meant to provide an inkling into the investigation of complaints carried out by the Ombudsman and the Commissioners, the considerations on which their final opinions are based and the type of remedy or redress recommended. This year’s edition, as usual, tries to report cases that are of general interest and represent a good cross-section of the complaints investigated by the Ombudsman and the Commissioners. This concern was also highlighted by the Venice Commission in their opinion on Constitutional arrangements and separation of powers and the independence of the judiciary and law enforcement. In this respect, the Ombudsman welcomes the commencement of the legislative process initiated by Government in Parliament on changes suggested by the Venice Commission.